I’ve been off-blog for quite a while. I realized that a lot of the short incidents, like what I’ve bought at the Farmers’ Market, are getting shared on Facebook these days. I haven’t done much on Twitter, and I’m not on Instagram, so I can’t use those two as an excuse. Lately I’ve run into situations that made me think, “I should blog this.” Sometimes it’s Amigo who tells me, “Mom, you should blog this. Really.” And I realize that the Pharmacy that Shall Not Be Named has improved to the point that they don’t make the blog anymore, but the Clinic that Shall Not Be Named still rates a post now and then. The worst offender lately was my employer-provided health insurance. I’m still very angry with the folks at charge there, so I’m not ready to post. I might be ready to write it, but I’m not quite ready to post. And the “Smart” MRI place? I’m not sure whether to christen them “Stupid” MRI or “Dollar Store Variety MRI.” Frankly, either would fit. I don’t want to blog my Packers. At the moment, their record is the same as the Cleveland Browns. At least the Browns inspired Budweiser to Open the Refrigerators – Clay Matthews is only inspiring yellow flags at the moment, deserved or not. 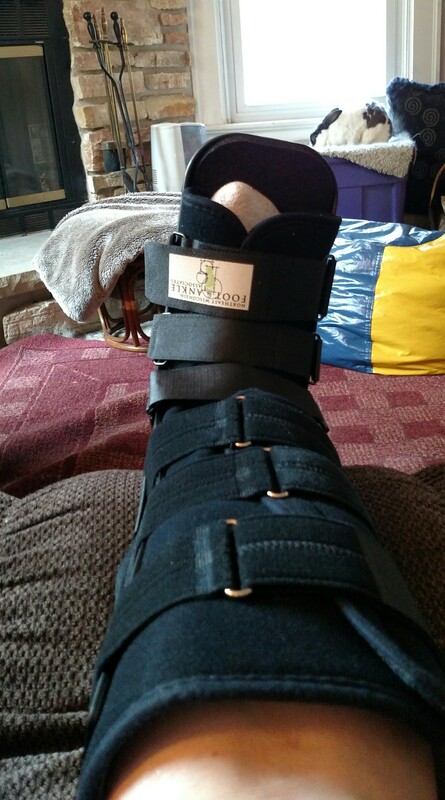 I’m in this boot for six weeks – one down, five to go. Updates to come. for the Boot and its progress, I’ll need a full post – or two. Safe to say, Daisy will be back. Besides, there’s an election coming up. I’ll have all kinds of plenty to say. I get it. I do. I understand that I had my last mammogram in August of 2017. I know that I cancelled my August appointment this year. Really, though, you could have saved the postage on that little reminder letter. You know the one: the letter reminding me that a full year has gone by and I haven’t had my next mammogram yet. You see, Clinic that Shall not be Named, I have already rescheduled the mammogram for mid-September. If your computer system had been programmed to make one more step, perhaps a search for an upcoming appointment, there would have been no need to send a reminder letter by way of the USPS. I suppose it could have been worse. If Clinic that Shall not be Named made robo-calls instead of sending reminder letters, then I would have gotten very irritated and perhaps my blood pressure would have escalated. At least with the silly letter, I just laughed and ripped it up. In conclusion, Clinic that Shall not be Named, once again your right hand doesn’t know what your left hand is doing. Get with it, okay? Okay. Sorry, no partridge in a pear tree. I’ll share a few other numbers with you, though. And my first ride on Uber! Well, in all honesty, the school district didn’t give me the Uber ride. With several hundred teachers and other school peoples converging on my fair downtown’s new Exposition Center, I knew parking would be crazy. With my recent surgery, I’m still not up to strength – at least enough strength to walk from a city bus stop or downtown parking venues. I decided to try out Uber. We established a family account so Amigo could use it when he needs to get somewhere, so I thought, why not? It’ll cost me a few bucks, but I’ll get dropped off right at the door, no parking problems, no need to walk any distance. It was worth the cost of the ride to get me to the door and drop me (I am not making this up) right in front of the school superintendent as she walked up the steps. So on we go, boats against the current – oh, wait, that was the incredible downpour later in the day. Never mind! Carrots. Once again, the carrots struggled. Maybe something feathered ate the seeds. Maybe something furry nibbled the greens as they emerged. In the end, I picked six. Six carrots. I had planted a smaller variety to give them a fighting chance at getting through the topsoil without fighting the clay below, and I think the few that actually grew did pretty well. Buttercup had three, including greens, for her supper tonight. She liked them well enough. Lettuce is done. Buttercup is nibbling the last few leaves of yellow/green lettuce tonight, too. Such a lucky bunny! I turned the soil with my as-seen-on-tv Garden Claw that I bought from a rummage sale a few years ago. I felt a little sad when I overheard the teenagers at the sale saying, “Oh, Grandma always loved using that in her garden!” I don’t know if Grandma passed away or moved to an apartment, but I hope she knows her as-seen-on-tv Garden Claw is in good hands. I use it often. Next: the decisions. I could start spreading compost now to let it settle in sooner rather than later. I could plant peas again; chances are good they’ll come up before the big frosts in October or November. Climate Change has stretched the fall gardening season a bit; planting again might be worth the effort. And that’s only half the plot, really. Tomatoes are growing and producing well. Broccoli and cauliflower are starting to smell like broccoli and cauliflower. They’re not big enough to pick yet, but I predict they’ll be delicious. Zucchini, of course, is thriving. We’ll have zucchini bread at least once this week. And then there’s the random corner, the area full of volunteer and mystery flowers and others. This might require pictures to do it justice. Before I plant any peas or spread any compost, I’ll share the odd corner with you. And readers? Yes, you? Teachers go back to school this week. There will be limited time for gardening. Limited, I said, not no time at all. Playing in the dirt is an after school sanity saver, after all. Long, long ago, when I was a teenager, I had a part time job in the food service of the local hospital. I learned about nutrition, and I learned about hard work. I learned about balancing school and work, saving money, and getting homework done – well, most of the time. 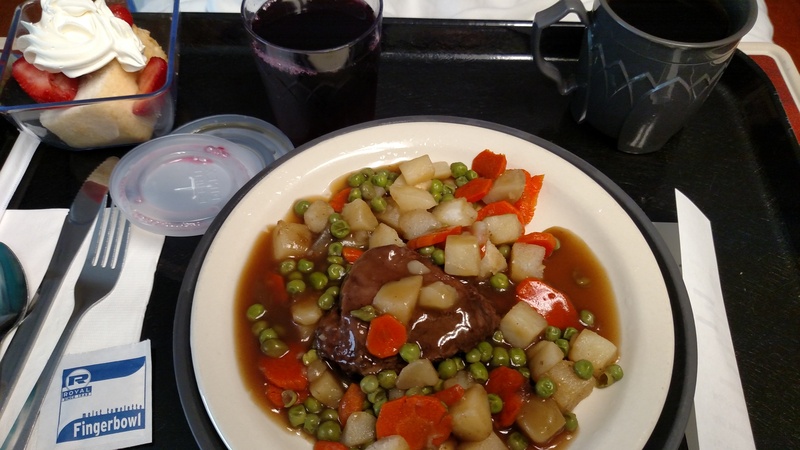 I learned that hospital food wasn’t as bad as it was reputed to be. It wasn’t great, but it wasn’t horrible, either. I’m sure I gained a few pounds sampling extra desserts with my coworkers. The local hospital system (let’s just call is Local Hospital System) doesn’t use the tray line and simple choices that we used when I was a teen and even when my babies (now 26 and 30) were born. Local Hospital System has a menu, almost restaurant style, in place. The patient calls the kitchen to order a meal, and someone brings it up in 30 to 45 minutes. I have to admit, I’m impressed. These beans were good – so good that I asked the nurse if they were locally choice. Surprise! She knew, and the answer was yes! Local Hospital System owns and operates a garden. I didn’t ask – the floor was pretty busy when I had my lunch – but my prediction is: carrots, fresh and local; peas, very possibly local; potatoes; hard to tell. But in any case, it was delicious. That little container in the upper left corner was my dessert: angel food cake and strawberries with whipped cream. Simple and perfect for my healing body and tired tummy. I don’t plan on another hospital visit soon, but if I have to stay overnight, I know I’ll be well fed. 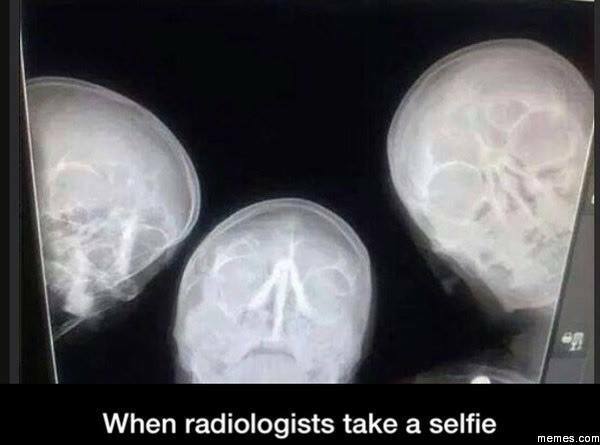 Here it is again; the radiologists taking a group selfie. If I’m smiling as I go under the anesthesia, it’ll be with this in mind. Last time I had my head examined (literally), Doctor Intervention noticed that the aneurysm in a major artery had grown. That growth was measured in millimeters, but it was still significant growth. He recommended treatment; I agreed. The insurance company sat on it for as long as they could before approving the procedure. Don’t they know that school starts for teachers in two weeks? Before you say, “Um, no, they don’t know or care,” keep in mind that when a health care group takes on a school district as a client, the school calendar matters. It matters a lot. So, anyway, I’m having a major surgery today. By the time you read this, I may already be finished and regaining consciousness. I trust my doctor – he’s brilliant – and I hope the anesthesiologist who works with him is equally fantastic. Readers, I’ll fill you in when it’s over, with a minimum of TMI, I hope. Wish me luck. Our local music community is tight knit. We may all excel in different genres of music, we may all play or sing different instruments, but the common thread of music runs strong in all of us. Indy performers, backstage technicians, classroom teachers, and more; we appreciate each other for the diverse talents and thrive on the knowledge that builds enjoyment. When a musician dies – oh, whenever someone special and amazing passes on – I think of Brahms. In my teens I was a pretty good pianist. I loved to play Debussy, Chopin, Bach, and works by other composers. I couldn’t quite get the hang of playing Brahms. I could play the notes and handle the technique, but I couldn’t master the emotion and the expression that really gave the piece the richness that was Brahms. I took my hands off the keyboard and listened. This conversation happened about forty years ago. I was a teenager at the time. Despite the years, I remember it clearly. I can see the room, the other person in the conversation, and I can hear the words in her voice. I remember my initial reaction was to balk at Brahms and his connection with death. As I grew older and experienced more life, I learned to understand and enjoy the exceptional depth of Johannes Brahms’ compositions. This conversation happened about forty years ago. I was a teenager at the time. Despite the years, I remember it clearly. I can see the room, the other person in the conversation, and I can hear the words in her voice. And that catch in my throat? Maybe it’s Brahms; maybe it’s knowing that music soothes as it allows us to grieve. Maybe it’s the bittersweet nature of musicians, the sensitivity that leads us to enrich lives of others as we enrich our own. Amigo asked me to look at a “mole” on his hip. This mole had always been there, as far as he knew, but it had started hurting. At first glance it looked like a big bug bite: raised center, red rash around it. I touched it, he flinched, and I realized there was more under the skin. We made an appointment to see Family Doc, the guy who knows us best. The pain had increased overnight, and the red rash had also gotten bigger. Doc gave Amigo the news: it was a cyst, the cyst was infected, and it had to be lanced and drained. He would numb the area first, and then get all the gunk out. Oh, it wasn’t pleasant, but Amigo took it like a trooper. He managed to stay still despite the pain of the numbing agent, and then accepted a damp compress on his forehead to help him focus and relax. Doc removed what he needed, stitched the area closed, and then covered it with a piece of gauze and tape. We’ve been back twice to have Family Doc monitor his progress. Amigo took antibiotics to kill the infection, too. At this time, I’m checking on how it’s healing and putting clean gauze on the wound each night. Eventually, he will need the cyst removed. Neither of us are looking forward to this. Fortunately, a cyst on the hip doesn’t stop him from singing. Amigo has joined a small group in the barbershop chorus: the Mixmasters. More music is good music! or something like that. I’m temporarily on injured reserve, as Chuck puts it. I cannot lift anything heavier than 5 pounds or handle anything dirty or germ-laden. Such is life as an artery heals! Friday went smoothly overall. Pre-procedure fast: check. Light breakfast (two frozen waffles, toasted): check. Morning medication: check. Doze off while reading newspaper: check. Oh, I admit it, that wasn’t on the list, but a nap was still a good thing. Anti-germ shower with soap from doc’s office: check. Arrive at hospital on time: check. Find registration in a labyrinth that is the hospital: with the help of a volunteer: check. Change into hospital gown and socks: check. Vital signs: check. Blood draw, IV inserted, etc. : check. Admire the nurse’s Crocs featuring the Swedish Chef: check, bort! bort! bort! Procedure: one long involved check. The purpose for Friday’s O.R. encounter was to insert a catheter through my wrist and send dye coursing through the arteries in my head to confirm what the MRA and Doppler Ultrasound showed. Stent in right interior carotid is working well; blood is flowing through the artery as it’s intended. Aneurysm on the left: somewhat larger than it was a year ago. Recovery! Remove catheter from artery: check. Place pressure bandage over artery: wow, check. This thing was “blown up” with air to hold it tightly on the artery and prevent bleeding. Move patient (me!) upstairs to hospital room for observation while recovering: relief of sorts, check. Nice view of the river below and the pelicans and geese feeding. Rather fun, really. If I had to stay longer, I’d like a room like that. But anyway, over a span of a few hours the nurse gradually let the air out of the pressure bandage and verified that the artery was closing. I had a hospital supper: baked penne pasta with marinara sauce and a small lettuce salad. Yum. 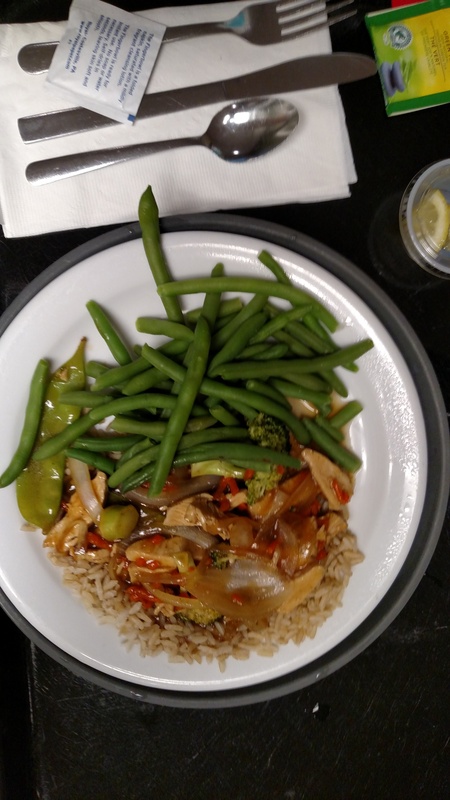 Hospital food has come a long way since I was a teenager working in a hospital kitchen! Well, folks, that was Friday. The prep, the procedure, the recovery, then home. My discharge instructions were what put me on Injured Reserve, in Chuck’s words. The remaining bandage stayed on for 24 hours. Limit lifting to 5 pounds. Avoid contact with contaminated items, including litter boxes or gardening. These limitations are in effect for 3 days or until the wound heals. I can water the garden using my left hand, but I can’t weed it or otherwise play in the dirt. I might be sore and tender for a week or two. There’s a little bruising, and that’s considered normal. As I heal, I’ll get back to the normal roster of gardening and cooking and other daily tasks. Meanwhile, I might just hang out with my laptop and rest. After all, I am on injured reserve.